This is the type of treatment that Black students are getting in school. AFRICANGLOBE – A white teacher in Baltimore was fired after crossing a line with an unruly class of 8th graders. 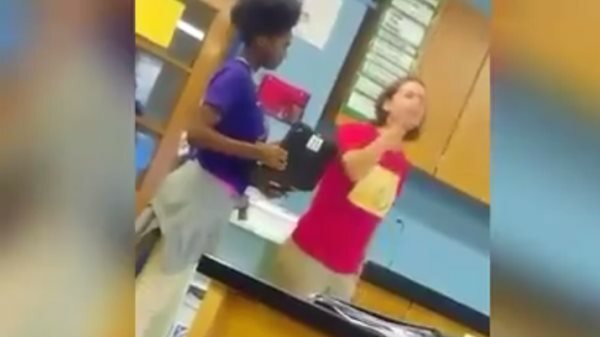 A student filmed her losing her temper and calling her Black students “punk @ss n*ggers” who would be shot as a result of not doing their schoolwork. Parents of students at Harlem Park Elementary and Middle School are livid after a tape surfaced documenting a white teacher using racial epithets to admonish her students. The video shows her growing increasingly frustrated with an uncooperative student and demanding he leave the class. This did little to encourage the class to calm down and focus on their school work. It probably did not help that all the students seen on the recording were Black. Erica Gales Deminds, 32, had a son in the classroom at the time, and he showed her the video. She was shocked to see it as she had known the teacher for a few years and had even met one-on-one with her. “She’s a very nice teacher. I can’t say what happened that day. I think she was at a breaking point,” Deminds told reporters. However, the language in the video still shocked her.